Do you drink coffee?? Are you one that your eyes don’t quite open up and have you ready to face the world, much less three demanding kids, without your morning cup? Well I won’t say that fits me to a “T” but I do love my coffee (in my case espresso and LOTS of milk, with chocolate syrup) and sometimes when my day gets hard I’ll make an extra cup. There is just something about sitting there holding my nice warm mug as we work through school or what problem we are trying to solve today. 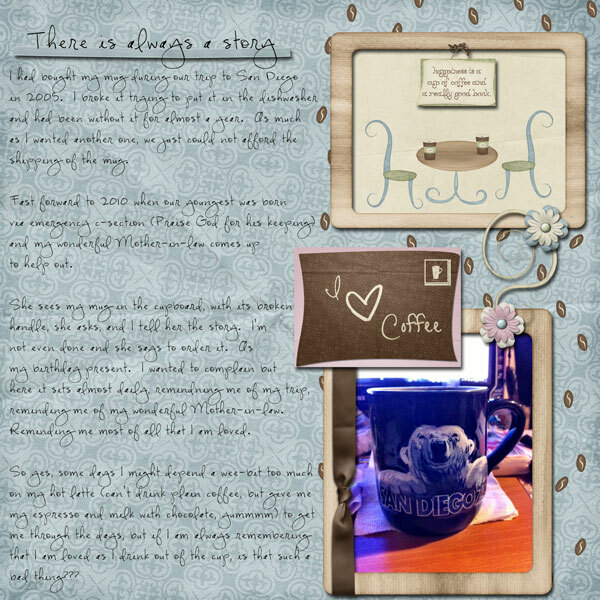 So I created my layout, with the story behind, “my mug”. One of two I reach for the in cupboard each morning. In fact I’ll clean it actually by hand (yes be shocked) if I didn’t get it through the dishwasher and my husband’s big Maine mug is not available. I just like how it feels and fits in my hand. I am still working on my photography skills but I took the picture where my mug is usually sitting, right here by my computer so there is a little glare there that I tried to cover up, I think it worked. So to pick up your copy of In the Small Things Morning Glory you can either go to Polka Dot Plum or Stuff to Scrap. Enjoy! Check back soon, there might just be a freebie from my layout for you to enjoy!